Did you know that yesterday was National Spaghetti Day?! Neither did I! Well, not until about 7 o'clock yesterday evening and I figured I shouldn't let it pass without celebrating. Luckily I had all the ingredients on hand to whip up some quick Basil Pesto. It's really simple and uses only six ingredients. What more could you ask for? I know it's a day late and the holiday has passed, but better late than never, eh? TIP: If you have some leftover sauce, you can save your pesto by freezing it in cubes in an ice cube tray. Once frozen, pop them out and save in a ziplock bag for long term storage. When it's time to use, zap them in the microwave or toss them in a saute pan to defrost. While the food processor is on, slowly add the extra virgin olive oil in a steady stream. Scrape down the sides with a spatula and add the grated cheese. Pulse again until well blended. Add salt and pepper to taste. 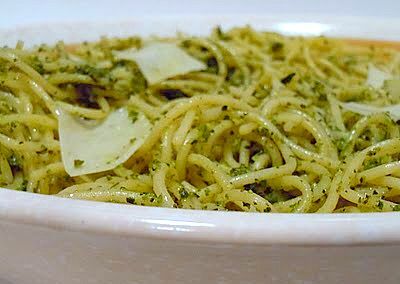 If pesto is thicker than you prefer, you can add a couple tablespoons of boiling water from the pasta water to thin it out. Pulse a couple more times until it reaches your desired consistency. Toss with pasta, garnish with shaved Parmesan or Romano cheese and enjoy! I save my spaghetti sauce and chicken broth (both home made, of course) in 1/2 cup measurements so I can plan without needing to defrost. This looks delicious, though, I'll have to give pesto a try. I'd love to see how your tomato sauce compares to mine (mine is up on my blog from Nov 28.). I just bought a big 'ol bag of basil for my chicken, and was thinking I needed to make a pesto sauce, so this is perfect! Mmmm...looks good! Since I am allergic to nuts, I am going to try this recipe without them. Any suggestions of what to substitue instead? p.s. Love the set up of your blog, and the name of it! Hey Melissa! You could try using sunflower seeds in place of pine nuts (if you're not allergic to them, of course!). I'd lightly toast them before to give them that "nutty" flavor. I've also read about substituting soy beans or olives for nuts. It's a completely different flavor but a great alternative! Let me know what you try and how it turns out for you! tospinayarn: My mom is Italian and makes amazing tomato sauce and she has has taught me how to make it just like she has been doing it for years and years. Her sauce recipe and meatball recipe will be featured soon. Thanks for the comment! wow, i love noodles and always try to new way to make it. i was tried last night seriously it awesome.